I made this cake for Victor’s birthday this year, and I don’t think he will ever let me make another cake again. It was, by far, his favorite cake ever! I plan to make this again for our Thanksgiving dinner, so I thought it would be nice to share the recipe again for those looking for non-traditional dessert ideas this year. 1. Preheat the oven to 350°. Butter two 8-inch round cake pans and line them with parchment paper; butter the paper. Dust the pans with flour, tapping out any excess. 2. In the bowl of an electric mixer fitted with a paddle, mix the flour with the sugar, cocoa powder, baking soda, baking powder and salt at low speed. In a medium bowl, whisk the buttermilk with the oil, eggs and vanilla. Slowly beat the buttermilk mixture into the dry ingredients until just incorporated, then slowly beat in the hot coffee until fully incorporated. 3. Pour the batter into the prepared pans. Bake for 35 minutes, or until a toothpick inserted in the center of each cake comes out clean. Let the cakes cool in the pans for 30 minutes, then invert the cakes onto a rack to cool completely. Peel off the parchment paper. 1. In a microwave-safe bowl, heat the chocolate at high power in 30-second intervals, stirring, until most of the chocolate is melted. Stir until completely melted, then set aside to cool to room temperature. 2. In the bowl of an electric mixer fitted with a paddle, beat the butter at medium speed until pale and fluffy. Add the egg yolk and vanilla and beat for 1 minute, scraping down the side of the bowl. At low speed, slowly beat in the confectioners’ sugar, about 1 minute. 3. In a small bowl, dissolve the instant coffee in 2 teaspoons of hot water. Slowly beat the coffee and the cooled chocolate into the butter mixture until just combined. 1. Set a cake layer on a plate with the flat side facing up. 2. 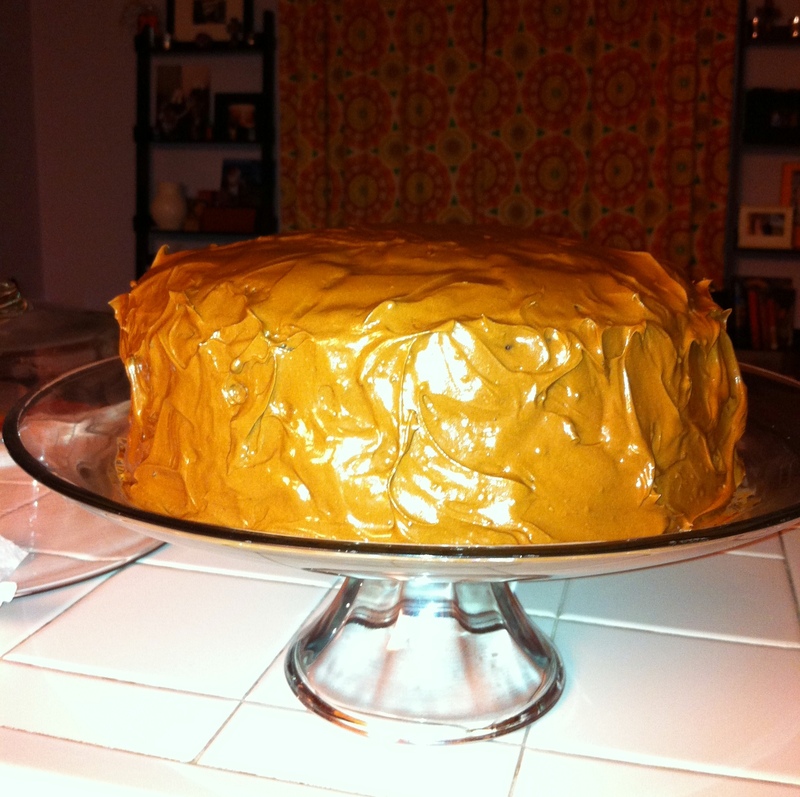 Evenly spread one-third of the frosting over the cake to the edge. 3. 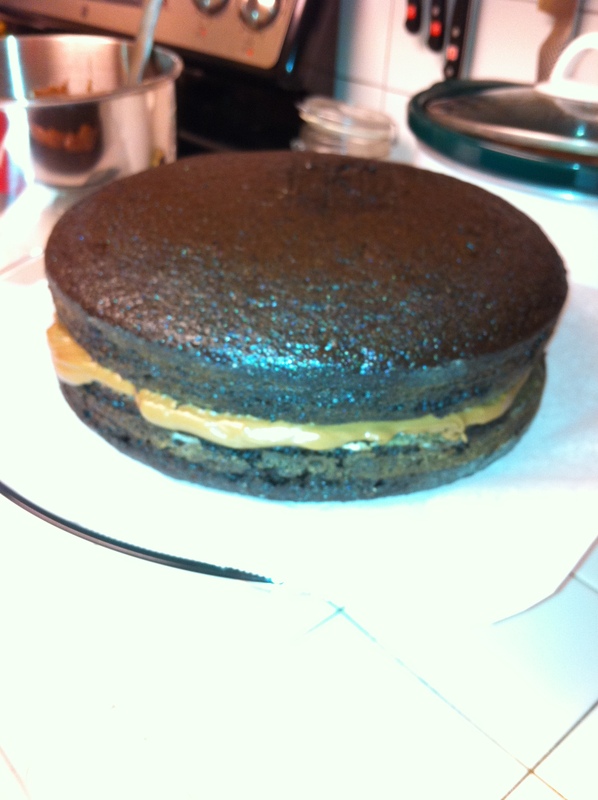 Top with the second cake layer, rounded side up. Spread the remaining frosting over the top and side of the cake. Refrigerate for at least 1 hour before slicing. Make Ahead Tip: The frosted cake can be refrigerated for 2 days. Let stand for 1 hour before serving.